Whilst we can create a basic structure to enable us to function for £25,000 we would benefit hugely from being able to include a decent dry tack/equipment room and feed store. With extra support we will include a classroom within our building to further our educational aims within the project. It would also be an important aim to be able to start a breeding programme here to actively make a difference to clydesdale numbers. Our work at Brimpts Farm with the Clydesdales brings us into an environment which involves more than just working with horses. We have become a part of a much wider operation where people come to experience Dartmoor through many activities and interests. We would like to use the new building to help in the interpretation of the natural and farm environment surrounding us for which we want to include a classroom/display room. We would love to have the resources to reach this standard of building. We are Aileen Ware and Tim Ancrum in association with Andy Bradford and Gabrielle Cross of Brimpts Farm. We are Aileen Ware and Tim Ancrum and we were searching for a place on Dartmoor to set up our business. Fortunately we met Andy Bradford and Gabrielle Cross at Brimpts Farm, they liked our idea and have supported us and got involved. They have kindly allowed us 6 years of working within the existing farm setup in half of their cattle shed. This, however, is not sustainable longer term and we must establish a dedicated base to continue our work. A site is available at the farm and we need somehow to raise enough money in order to build a suitable working space for looking after these magnificent beasts as they go about their job of impressing their visitors and riders and working about the farm. We have, over the last 18 years been doing our best to draw people's attention to the plight of heavy horses and in particular the Clydesdale. This has been our daily work and passion with all its compromises, long hours, little monetary rewards and sometimes a struggle to keep the wolf from the door. We and the horses can do this, but we can never earn enough to buy the perfect home for our purpose without the help of like minded people who care about our rare breeds and heritage. In order to operate efficiently, the farm business needs its calving shed back and we must vacate it by 31st March. Crowd funding is our best way forward. Numbers of Clydesdales are very low both in the UK and world wide and there is a strong possibility that they will shortly be just confined to the history books. 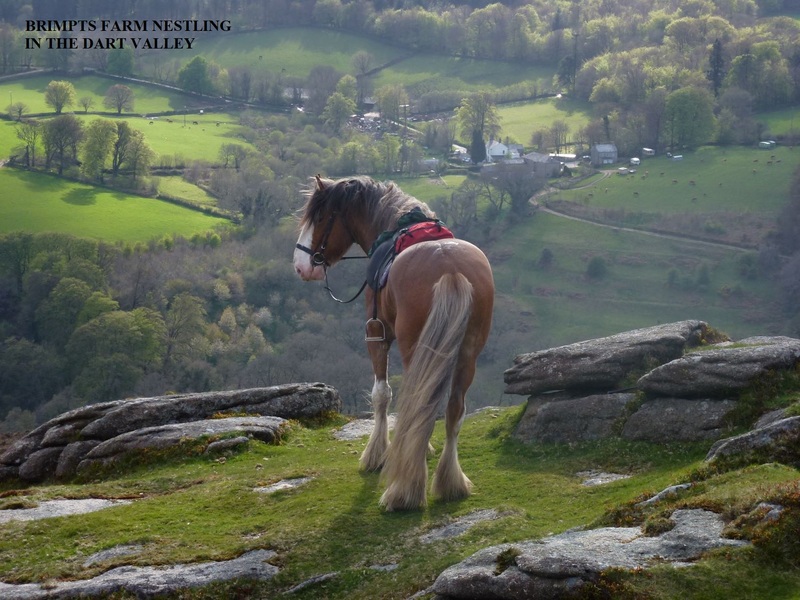 Our belief is that we can prove what special and valuable horses they are by introducing people to riding and working with them and doing this in the exceptional natural environment of Dartmoor National Park. Evidence that this is working can be seen in the impressive feedback we get from our guests, who wax lyrical about their experiences. The work of ourselves and others has increased the popularity of Clydesdales as well as heightening public awareness of their plight. The value of Clydesdales has improved with increased demand making it more viable to breed them. A relatively simple barn structure is in our vision, into which the horses, who normally live out, can be brought to prepare for their day's work, whether that is taking people out for a beautiful and exciting ride on Dartmoor, harrowing a field or meeting a group of children visiting the farm. The money we raise from our project is destined to provide a safe and comfortable environment to allow us to continue looking after the horses' needs as well as providing a facility for educating our visitors, volunteers and staff about the Clydesdale breed and our magnificent surroundings. Hands on experiences with the clydesdales is a part of what we do. Brimpts Farm itself, under the management of Andy Bradford and Gabrielle Cross is a fantastic location from which to run our project. They have a long record of successful diversification on the farm with many awards for the work they have done to make the place a hub of activity on the moor with a sensitivity to the beautiful natural setting. We need to build a steel portal barn similar to the building we use at the moment. The site must be levelled and simple foundations put in for the supporting pillars. The 45' x 60' building will include 5 pens and a concrete area for working with the horses. We can do this for £25,000 which would secure us a place to carry on our work but in order to move forward we need to include a classroom, tack room and feed store. If we raise more than £25,000 then we will be able to achieve great things in providing educational opportunities to further our goal in championing the Clydesdale breed. My name is Brae Park Tom, but my friends call me Tom Parker and I am a Clydesdale Heavy Horse, an old Scottish breed once used to pull ploughs, harrow fields and generally manage heavy work on the farm before the machines took over. We are tough, hard working and nobly carry within us all the traditions of an age old farming way of life. I live at Brimpts Farm on Dartmoor along with 11 other Clydesdales where we work for our living taking humans out on our backs to admire this beautiful place. We have been doing this job now for six years on Dartmoor and we have become quite famous. People love to ride us because we are very good at our job and we always impress them with our ability and our determination to get the job done. Quite often we do very long rides of several days and we stop at interesting new places, sometimes the grass is better and sometimes it’s not. We pride ourselves on our good nature and our patience with sometimes annoying humans! I think they call it “our temperament”. Our owners say that we are a rare breed and that we need to prove to people that we are worth protecting and, if that’s true then I’m well up for it! We do other things at the farm as well. Some of us are good at pulling things which the humans call draught work, and we don’t mind that as long as they feed us. We quite like meeting people too, we are especially loved by children and seem to bring particular comfort to those who have special needs. Not to say that we can't thunder down a race track to raise money for Devon Air Ambulance when required. 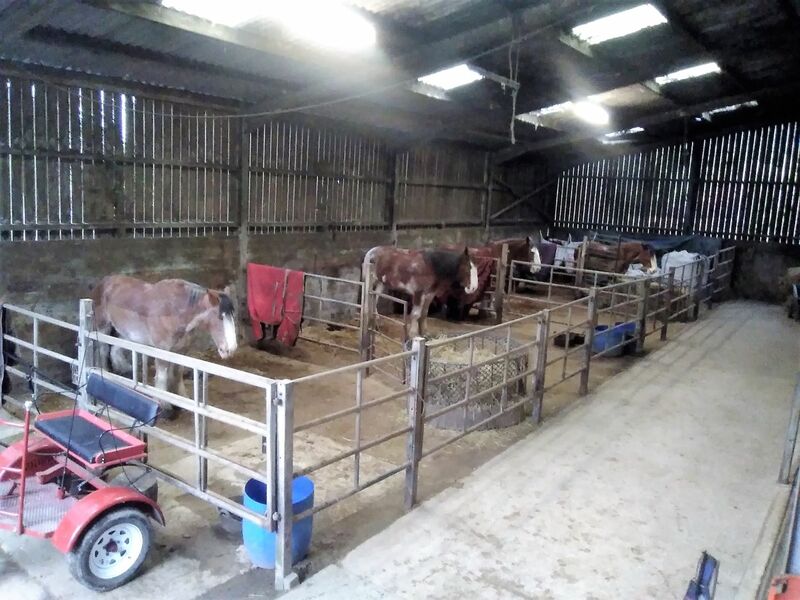 The kind people at Brimpts Farm, Andy Bradford and Gabrielle Cross have let us stay here and show people what special horses we are, but the cows in the shed next to us are complaining that we have taken their shed and they want it back, and who are we to disagree? So our proud owners, Tim Ancrum and Aileen Ware are hoping to build a new shed next door. This will give us a place to work so that we can continue to prove we are worth looking after. Trouble is, whilst we can work hard enough to pay our way, we can never earn enough to pay for building the new shed so Tim and Aileen are planning to run a crowd funding campaign on our behalf (we're not very good at social media) to raise the money for the project and this is where you come in as our friends and supporters. Everyone who donates will get their name added to the role of honour on the new building so they will be a part of this great project forever. bag with adventure clydesdale logo. 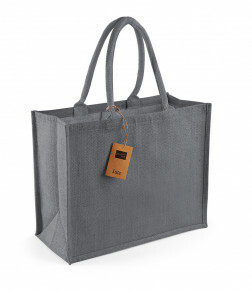 £100 gets you Mary Bromilow's acclaimed book, The Clydesdale workhorse of the world, a shopping bag with our logo. £200 gets you Mary Bromilow's acclaimed book, The Clydesdale workhorse of the world and an invite to our opening party. £500 how about a 3 hour ride or bring your own horse and have an escorted ride across Dartmoor, stabling overnight for your horse, and Mary Bromilow's acclaimed book, The Clydesdale workhorse of the world and an invite to our opening party. "Where do I start...well, if you want to ride through breathtaking scenery on a gentle (and rather beautiful) giant then do not hesitate! 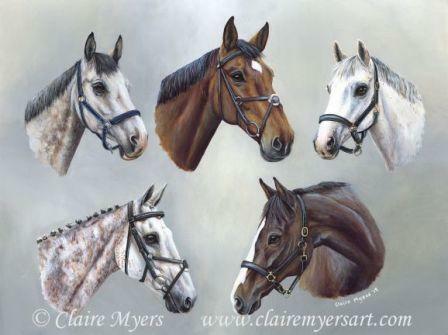 All of the Clydies are a dream- stunning, majestic and very handsome. They put you immediately at ease and carry you up hill/tor/anywhere really, and down dale. Tim and Aileen (and the rest of the crew) are great- professional, friendly and welcoming. It really is a fantastic experience and I for one can't keep away!" WE LIKED THE ONE DAY SO MUCH....WE CAME BACK FOR FOUR! 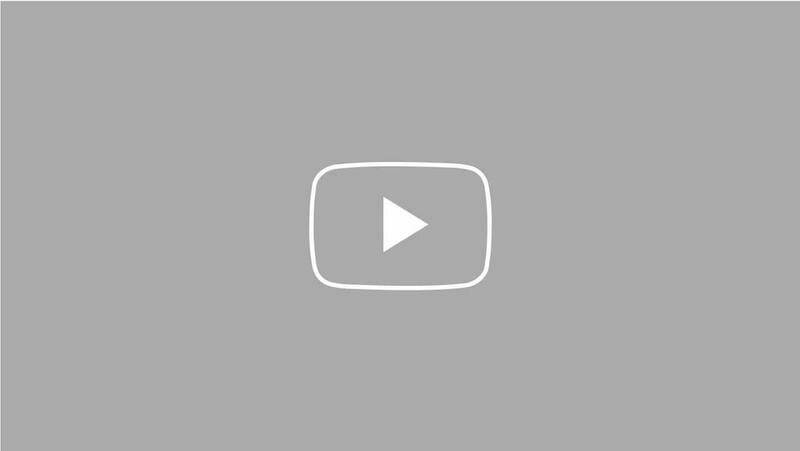 "Okay so we've been learning more skills and we decided to do the 4 day Dartmoor ride. We were lucky to have the same lovely horses we had back in March (Tom Parker and Big Al) and Tim & Aileen looked after us perfectly. The weather was variable but that's all part of the experience and mystery. Tim/Aileen run a highly professional setup and know how to handle the horses and the potentially dangerous terrain for the unwary. They know best! It was another great learning experience and if I can get half as good as Tim I'll be a happy rider! Thanks to you and the boys for being so awesome! It certainly was another great adventure." "I think the magic of the Clydesdale is the kinship between these horses. They ride together so that riding with them feels lije being part of their pack. And you feel privileged they are taking you to some of the most inaccessible and beautiful parts of the moor". Andrea Kuhn, Western Morning News. "As we launched into a canter and quickly progressed to full gallop, it is very hard to describe to you in print the sheer surge of power which burst through Tom Parker's body in those few seconds". Athwenna Irons, Western Morning News. "Veryan Codd, who is a huge fan of Clydesdales had travelled down from Leicestershire to watch the race and was thrilled to be the winning owner for the day of Midge. "It was such a fabulous race with a really great atmosphere, It's good to see these wonderful horses appreciated by so many people". Western Morning News. 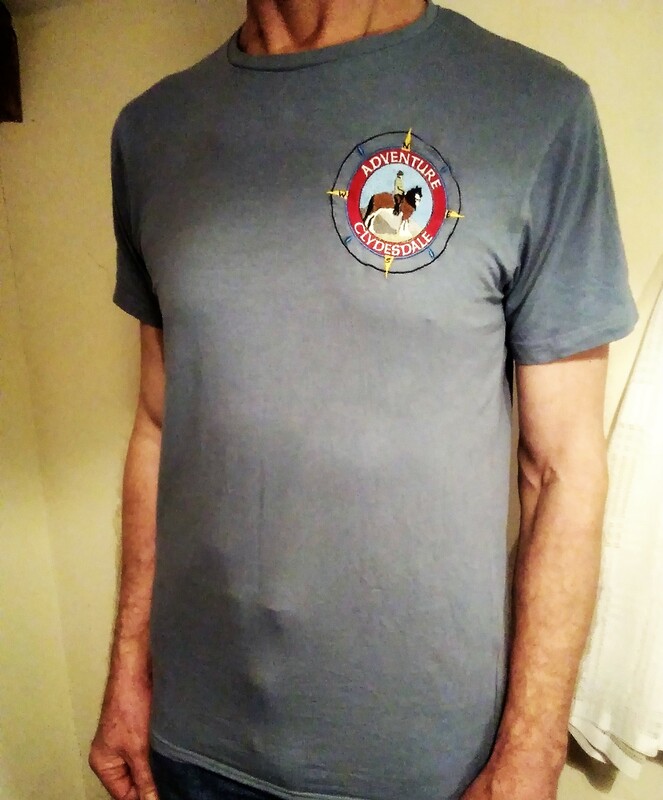 You will receive a lovely T-Shirt with Adventure Clydesdale logo. 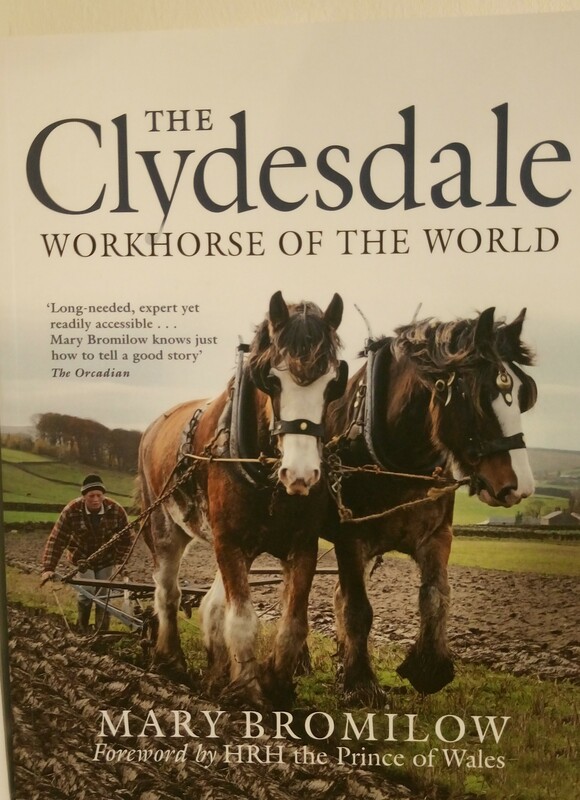 You can have a signed copy of Mary Bromilow's acclaimed book, The Clydesdale Workhorse of the World. 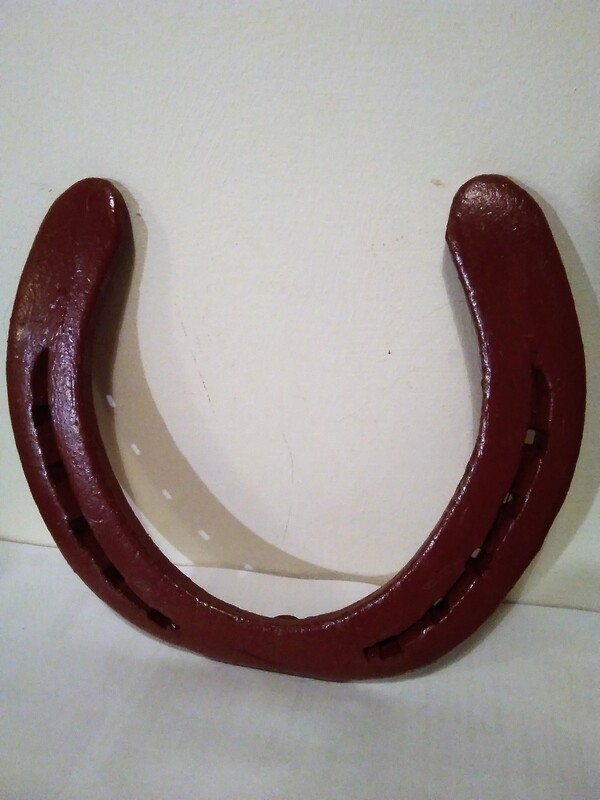 Exclusive varnished Adventure Clydesdale horseshoe from one of the gentle giants and a quality jute shopping bag with Adventure Clydesdale logo. Gets you a copy Mary Bromilow's acclaimed book, The Clydesdale workhorse of the world, a quality jute shopping bag with Adventure Clydesdale logo, T-shirt and varnished horseshoe.  Gets you Mary Bromilow's acclaimed book, The Clydesdale workhorse of the world and an invite to our opening party to celebrate the completion of the project. How about a 3 hour ride or bring your own horse and have a guided ride across Dartmoor, stabling overnight for your horse at Brimpts Farm. Mary bromilow's acclaimed book, The Clydesdale workhorse of the world and an invite to our opening party to celebrate the completion of the project.